Editor's note: Here's another guest post from my talented, witty, extremely attractive, and all around awesome wife. Yes, I outkicked my coverage. Anyways, here's a simple recipe using all TJ's ingredients for one heckuva great snack! Addictive. 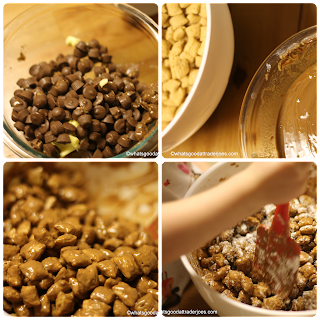 ...And that is how we ended up making Cookie Butter Buddies (or puppy-chow.) I don't know if your Trader Joe's has recipes hanging up by the restrooms, but ours has a ton, and there are a lot of good looking things to make! We picked this recipe because it was something fairly simple and kid friendly and approved. Mmm, doesn't that look good? First, melt about 8 tablespoons of butter (I chose Kerrygold because I love it, and would pretty much eat it if it were socially acceptable to walk around eating sticks of butter), the cup of cookie butter, I didn't actually measure this though, I just scooped out about half a jar, and the box of Milk Chocolate Mini Peanut Butter Cups, together in the microwave, in about 30 second intervals, until melted all together. In a large bowl, dump out the box of Puffins (M chose peanut butter, but I bet the cinnamon would taste great!) and pour on the chocolate mixture. Stir to coat. This was probably M's favorite part..."Stir! Stir! Stir!" she happily chanted while mixing it all up, leaving me for the "expert touch." Add in about 2 cups of powdered sugar. I started with one cup, and added from there, until your cereal is coated. Spread it onto baking sheets so that it can cool and harden a bit. It looked so much like dog food when I did this, that it was easy to see where it gets the name puppy-chow. Once it's set you can put it back into a bowl or into a large ziplock bag, add more powdered sugar, and stir or shake to cover it all. Add in a handful of the chocolate covered sunflower seeds and you've got a cookiebuttery, crunchy, tasty, and very, very, sweet treat. So, our first cooking with a TJ's recipe gets 8 Golden Spoons. I looooovveeee puffins cereal, but for snacking on dry- not in milk. I'm planning on making Puppy Chow with Cookie Butter, but I'm just planning to switch that part with the peanut butter. This looks so good though!! !